Celebrating in the spirit of Christian service influenced by the Missionary Oblates of Mary Immaculate and the Sisters of Charity of the Incarnate Word, our community seeks to give witness to Christ through living our mission. This witness is revealed through a prayerful, apostolic community committed to enabling our students to discern their calling in the church and in the world. St. Anthony Catholic High School is committed to the faith journey of our students. Weekly opportunity to celebrate this sacrament with visiting priests from throughout the Archdiocese, usually before mass each Friday. Access to more extensive spiritual direction with an Oblate priest is offered on an ongoing basis. Under the direction of our Theology Department and Ministry office, we offer spiritual retreats for all of our students and faculty. Seniors participate in an overnight retreat in the fall and a one-day retreat in the Spring. Ninth, tenth and eleventh-grade students have the benefit of experiencing a one-day retreat designed especially for their grade level. Our retreats are designed to include the participation of the Missionary Oblates of Mary Immaculate and Sisters of Charity of the Incarnate Word. The Prayer Process extends to our parent community as well. Our Parents at Prayer group has created opportunities for our parents to join in prayer as a faith-filled community. Parents are encouraged to attend Live Prayer moments on our campus throughout the year and participate in Prayer Services in our Chapel. All students who graduate from St. Anthony are required to commit to a minimum of 25 hours of community service per year of attendance, for a total of 100 hours. 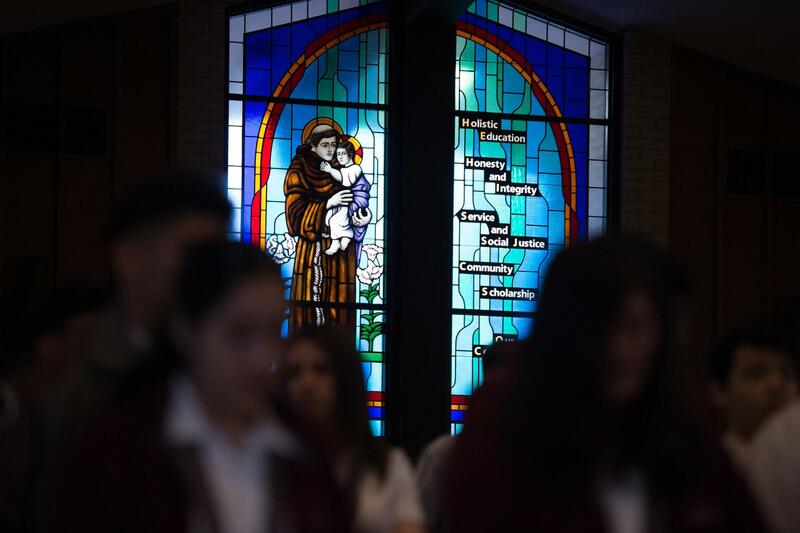 St. Anthony Catholic High School students collaborate with organizations such as Catholic Charities, San Antonio Food Bank, Ronald McDonald House, Morgan’s Wonderland, local parishes, and charitable organizations. In addition, the school community has established an annual Community Service Day, where students travel throughout the San Antonio area to serve those in most need of God’s love.